The type of investment that dogs are willing to put into caring and protecting their family members should be enough reason for you to provide him the best things in life so he remains, happy, wide-eyed and bushy-tailed. This means spending as much time as you can with your dog, buying him treats or purchasing your furry guardian a high-quality dog bed. But with a plethora of options in the market, finding the best beds for extra large dogs for your gentle giants can be a challenge. Overpriced mattresses are continuously flooding the market, and they aren’t even worth half of the money you paid. Hence, we’ve done the research for you and narrowed down seven of the best extra large dog beds. We broke down the pros and cons of each model so you can distinguish the differences between beds and find the one that will suit your needs best. If this is your first time buying a large dog bed, below are a few guidelines to help you. It is best to get an extra large dog bed, whether your dog is a large breed or a giant one. A few extra inches make sure that your dog can sprawl out or circle around. 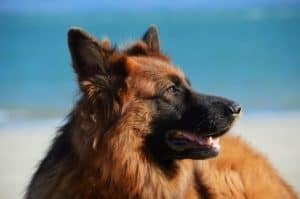 Eight out of every 10 large breeds are at risk for arthritis. When your dog has arthritis, every move can cause pain and discomfort. An orthopedic dog bed can serve as a preventative and a healing tool. It fully supports your dog’s weight and conforms to your dog’s contour; thus, the pressure is distributed equally throughout the body and not into the joints. If the bed is not made of high-density foam, chances are it will flatten out over time. Cheap filling won’t hold the brunt of a massive mutt. A memory foam, on the other hand, would be ideal: you won’t find fillers getting pushed to the edges by your dog. An extra large dog bed won’t fit in a washing machine, so make sure its covers are easy to remove and safe to machine-wash. You need to wash bed covers at least every week to keep germs and odors at bay. If there are replacement covers sold separately, the better. This orthopedic dog bed has been featured many times on Dog Bed Zone. There’s a good reason why. A soft, comfortable bed that won’t get squashed by a heavy dog is one of the rarest finds in the market. Good thing Big Barker has taken care of that problem. If you have a furry giant at home, know that the Big Barker Headrest Edition Orthopedic Dog Bed can cater the needs of your large dog.This dog bed features a perfect combination of incredible weight support, durability, and comfort. You won’t have to take our word for it. Over 50, 000 dogs and their beloved owners can attest such claim. The Big Barker Headrest Edition uses open cell foam for maximum insulation and is precisely calibrated to provide even weight distribution and to properly support every inch of your heavy dog’s body. Its seven-inch therapeutic foam is simply one of the best. Extra large dog beds such as the Big Barker Headrest Edition can be very relaxing, even for you! It is proudly American-made and meets the high standards of CertiPUR-US for content and emissions. Thus, you can rest assured that your beloved dog is not inhaling toxic fumes while he sleeps. Aesthetic-wise, it’s a beautiful piece of furniture. A dog bed blotting your well-decorated room is far from happening. Likewise, this bed is very smooth to the touch. Plus, it has easy, removable bed covers that you can machine-wash.
You will surely love how happy Doggo will be with the comfort he gets from the PetFusion Ultimate Premium Edition dog lounge. This dog bed has garnered thousands of positive reviews from satisfied dog owners across the world wide web. 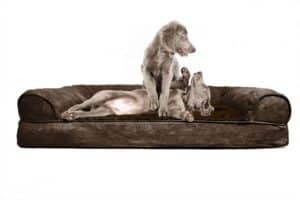 Take note that one of the most important factors to consider in getting a dog bed is the quality of its mattress, and PetFusion surely has that in mind when they created their Ultimate Premium Edition dog lounge. First and foremost, this bed highlights its orthopedic memory foam that is four inches thick. Now that is absolutely ideal for large breeds and senior dogs, as well as for medium-sized dogs who love to share. In addition, this bed comes with well-filled bolsters to give Doggo extra support and comfort. Unlike regular beds, orthopedic memory foam conforms to your dog’s contour; as a result, it minimizes the pressure on his muscles and joints so he can enjoy a long, comfortable, and pain-free slumber. Likewise, its thickness is more than enough to support the brunt of an overweight dog or a large breed. The PetFusion Ultimate Premium Edition dog lounge is well-engineered using only high-quality materials. You can find no fault even if you check its seams and zippers. In addition, this bed features a non-slip bottom and waterproof inner liner. Moreover, this bed has a water and tear-resistant exterior cover that can stand the wear and tear of endless gnawing and chewing, as well some little accidents in between. Likewise, it comes off easily and is machine-washable, allowing you to get rid of stains and smells with ease. With all these key features, this bed surely is an ultimate of quality and comfort. The KOPEKS Orthopedic Memory Foam dog bed is among those dog beds that stands in the middle ground for price and value. This bed consists of two layers of foam: a 4” thick high-density foam which is its base and a 1.5” comfort memory foam on top. Its memory foam, which is similar to high-end mattresses, provides optimum comfort and weight support. 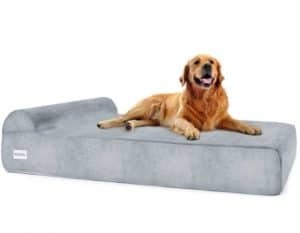 The mattress conforms to your dog’s sleeping position, and hence minimizes muscle stiffness and pain caused by arthritic conditions or hip dysplasia. Plus, it features a built-in headrest pillow made with the same orthopedic and hypoallergenic memory foam. 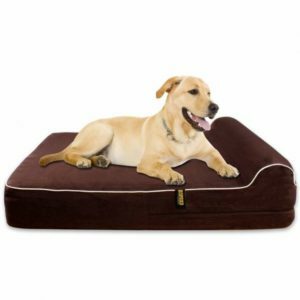 In addition, the KOPEKS Orthopedic Memory Foam dog bed includes a water-resistant inner liner that protects the foam from puppy accidents. Likewise, it also has beautifully smooth suede exterior cover, which only makes the bed more inviting! Both covers are easy to remove and wash. Even if you’re the dog is quite hyperactive, the anti-skid rubber bottom will help keep the bed stationary. Lastly, this bed comes in three sizes to make sure that toy dogs to gentle giants can all enjoy this nice, comfy bed. Whether your dog is young or young at heart, he will surely love the irresistible softness of the FurHaven NAP Plush Faux Fur and Suede Orthopedic Sofa Bed! 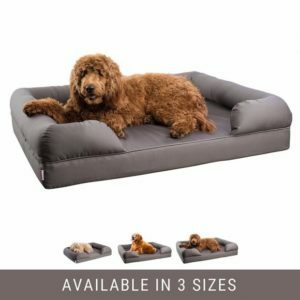 This two-in-one product is designed to give your fur-kid maximum comfort so he can enjoy a long, peaceful time dreaming. Its ultra smooth and soft surface is the epitome of coziness, plus there are matching suede bolsters to give your dog’s sleepy head support. The suede bolsters surround three sides of the bed, providing a lounge effect for a resting dog. 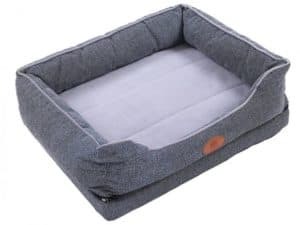 The FurHaven NAP uses orthopedic egg-crate foam and hence is most suitable for convalescing pets or senior fur-buddies with arthritic conditions. Its body-contouring foam provides maximum support for your dog’s frame and weight; thus, minimizing pressure on joints that cause pain. The deep, convoluted base also provides good insulation, which makes it ideal for use even during warmer climates. In addition, the FurHaven NAP orthopedic sofa bed uses high-loft poly-fiber filling derived from recycled water bottles. This is an important feature for those whose advocacy is to live green. Likewise, its bottom is made of water-repellent poly-canvas to protect your floor from leaks and moisture. Another great thing about this bed is how easy it is to clean. With the feel of a sofa and bed at the same time, your dog will no longer have to steal your bed or climb up the sofa, especially when climbing into the couch has become a struggle. Thankfully, this bed is available even for gentle giants. The largest size measures 44” x 35” X 4.5". You can also choose between four colors: Espresso, Gray, Clay, and Deep Pool. With so many features, the FurHaven Nap is inarguably one of the best extra large dog beds you can find. What is more, it is easy on the budget! If you have a large dog taking over the sofa, chances are, there won’t be enough space left for you to sit while he happily lallygags his tooshie. Perhaps it’s time to buy him a Petlo Orthopedic Sofa Bed. The largest size measures 46” x 36” x 10”. If you’re wondering why this is one of the best extra large dog beds out there, take note of its high-quality construction. This orthopedic uses high-density foam that is five inches thick. It is by no means filled with cedar chips, substandard foam, or cotton batting. This bed is very sturdy yet downy, so your dog can lounge like a boss or sleep like a baby. In addition, this bed provides therapeutic effects for senior dogs. It can properly support your dog’s weight and conform to his sleeping position; thus, relieving him from joint pain. Assembling this dog bed is a breeze. Plus, its removable covers are easy to wash. Both bolster and mattress covers are made of tear-resistant poly-cotton fabric to endure the chewing habits of your dog. Large dogs, who are more prone to arthritic conditions, need a heavy-duty dog bed such as the Petlo Large Orthopedic Dog Bed. This bed is made of top quality memory foam, making sure that your deserving dog has an ultra soft and comfortable spot to sleep. From Beagles to Mastiffs, this bed can accommodate any dog size. The Petlo Large Orthopedic Dog Bed consists of two layers of memory foam, providing incredible support for your heavy dog. When it comes to finding the best extra large dog beds, strength is the key to determine whether such bed will allow your dog to sleep comfortably secure. Apart from a good night’s sleep, this bed provides therapeutic benefits for your pet. When he’s happy and healthy, he can do more things and spend more years with you with a better quality of life. What is more, this bed is water-resistant, a feature so important to keep your dog’s sleeping quarters free of odors and microorganisms that cause health issues. Its soft velvety cover is also machine-washable. This bed also comes with a built-in headrest, just in case your dog loves to lean his head. He may be the biggest, fiercest protector of the house, but he also needs all the tender loving care he can get from his family. So for your ever-loyal dog who is simply the best, extra large dog beds such as the PLS Birdsong Fusion Orthopedic Dog Bed would be a great choice. The PLS Birdsong Fusion Orthopedic Bed is specially designed to provide the maximum comfort for your pets. Take note that it is a two-in-one product: with its bolster sides, it can be a couch or an instant mattress with its bolster sides removed. Likewise, it can be used indoors and outdoors such as porches, garages, as well as inside his dog house. With its anti-skid bottom, you can rest assured that your dog won’t trip or fall off balance. 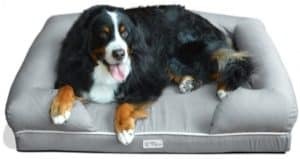 In addition, the PLS Birdsong Fusion Orthopedic Dog Bed features a water-resistant liner to protect the foam from fluids as well as a water-resistant bottom to shield your floors from moisture. The covers, including the bolster covers, are easy to remove and safe to machine-wash. Moreover, this bed is available in four sizes so your little dogs can have their own Birdsong, too. Hopefully, we have made the process of getting a dog bed easier for you with the information we gathered. Remember that large breeds are the most vulnerable to arthritic conditions due to their weight. Therefore, it is important to invest in a high-quality dog bed for your beloved furry buddy such as the Big Barker Bed, so he can sleep peacefully and prevent complications linked to his physique. Granting you use all the information wisely, we are sure that you can make a perfect choice even if it’s your first time.